The morning is quiet in my house, 'me time' as I slowly wind up to face my day. Journaling reads: Curling up on my chair wuth a cup of coffee, browsing blogs & Instagram. My favourite way to start the day. This layout was created using a sketch template from Simple Scrapper's April Membership collection. The products are a mix of very old, such as the thickers and blue patterned paper, and new, like the cork embellishment and Studio Calico Project Life card. The hours upon hours of slow, painstaking work when a simple slip could mean starting the piece again. The detail, symbolism and iconography, the stories they tell. The history and longevity, the grandness. Stonework rewards you for stopping and really looking. Prompted by the Simple Scrapper Story Starter theme for April, Right Now, I decided to record some thoughts about our life right now, after two years of us. Journaling reads: Right now I feel like these two years have disappeared in a moment, but yet it’s hard to remember a time when we weren’t us. We’re organising a wedding, discussing flowers and cakes, scouting out Fairfield Park as a photo spot. We’ve made our first honeymoon booking, Machu Picchu and the Galapagos Islands, which makes me dream of other destinations we’ll explore together. We’re imagining our next house, with large organic wood desk in the study, barn door and (according to Mike) hidden spiral staircase to the attic. We’re balancing time together and apart, from shiftwork to personal projects, another separation coming when Mike treks Mt Everest although an interstate training course could sneak in first. We’re teasing each other about a future of dirty nappies and sleep deprivation, wondering what our life together might bring. This is us, 18 March 2014; the second anniversary of the text message that started it all. This layout uses a 12x12 sketch template from Simple Scrapper's Premium Membership collection which I altered to suit 8.5x11. Although I haven't made a conscious decision to switch layout sizes, it's been a long time since I've completed a 12x12 layout! One of the advantages of the smaller size - I printed my journaling directly onto the background paper. The patterned paper is primarily a mix from Maggie Holmes' Styleboard with some older Studio Calico chipboard letters, wood veener and pop dots. The other day we were talking about the wedding and a friend commented that 8 months wasn't really that long. I've since realised that the countdown is much closer to 7 months than 8, and 7 is almost 6 and that's just freaky. Where did the last 5 months go? There has been progress - we've chosen a celebrant we're very happy with - but I'm realising that each decision results in more questions. What rituals will we do? How many readings do we want? What readings and who will read them? Oih. During our first meeting the celebrant, Leigh, talked through the running of a service. By the time she mentioned father walking daughter down the aisle - the very start of the rundown for goodness sake - I was battling tears. I think it was the first time the wedding was really real for me. We aren't just planning a big, expensive party; we're pledging to spend our lives together, with all the love, optimism and tradition that that entails. 22. Bake a dessert pie. Oh, and we did feed our guests a few other dishes too. I roasted beetroot for the first time. It was a great night, and definitely something we should do more often. 9 tasks complete, 21 to go. Today is BoyF's birthday, and between the hours of 4am and 8am is the only time we'll be in the same place to celebrate. Pretty sure one or the other of us will be asleep that entire time though! Despite the fact you'll be missing me (right, babe!?) and I can't shower you with birthday hugs and kisses, I hope you have a wonderful day. I'm pretty certain you're going to be an incredible year! 1. Worked on Week in the Life. Yep, from back in September. The photos from Monday to Saturday are now finally selected, edited and ready for printing, with just Sunday still to complete. 2. Had dinner with friends. Friday night in the city after work, planned with lots of emails and texts. Saturday night walking to the dumpling place down the road, spontaneously decided with a friend who wasn't ready to head home. 3. Sold my car. After a week-long battle with the insurance company to get them to return my calls, we ended up deciding to cancel the claim on my old car and attempt to sell it instead. We hadn't listed or advertised yet, but friend of a friend was interested and now it's all sorted. Well, almost, as the car still needs to pass roadworthy. 4. Attempted to wakeboard. BoyF, his brothers and I took the boat out on Lake Eildon yesterday - a fantastic way to spend a Monday! The weather was beautiful, the boat's new engine was growling (with only had a slight hiccup or two)...but wakeboarding is a skill that continues to allude me. I did manage to back the boat trailer down the boat ramp though, and that's a win. (We'll ignore the fact I had to drive forward and start again many times and relied on Steve in the passenger seat to tell me left hand/right hand down.) A ridiculously difficult task that I'm not volunteering to do again anytime soon! 5. Planted some vegetables and herbs. My thumb tends towards more black than green, but I'm ever optimistic. Coriander, basil and snowpea seedlings, and some peas from seed. After breakfast at a Balnarring cafe, Mike and I began Saturday with a visit to the Red Hill market. I was a little disappointed when we first arrived, but then we turned a corner and there were more stall, and more stall, and more again. It just kept on going! With cupcakes in hand we headed to up to the Arthurs Seat lookout, where we shared some great calamari for lunch, before driving south to Cape Schanck. There were some great views, all crashing waves and cliffs. We walked along the boardwalk and sat on the rocks for a while, resting and enjoying. Back in the car, I had it in my head I wanted to see to a pier so, when we saw a sign in Flinders, we detoured for a wander. We finished Saturday with a walk along the beach, talking about a future house and drawing plans in the sand, then cosying up in our accommodation, watching episodes of The West Wing, ordering (really great) pizza for dinner and sharing a bottle of red wine. It was pretty darn perfect. We'd just ordered our lunch when I realised I'd managed to leave my engagement ring sitting by the sink in the accomodation we'd left half an hour behind us. Yeah, oops! It's one of the reasons that I love BoyF, that this just wasn't a big deal. I'd made a mistake but ring was retrieved and all that we lost was time. To top off the weekend, we had dinner at a Thai restaurant with BoyF's family to celebrate his Mum's birthday, then decided to visit my parent's on the way home for a late cup of tea and to introduce them to Stormy. It was a truly wonderful weekend; just what we needed. On Friday I took the day off work and we headed off early to make the most of a long weekend at the beach. Thanks to an engagement present from friends we had two nights at Tulum, a great little studio apartment in easy walking distance from Balnarring Beach. We stopped in for morning tea with Mike's grandmother on the way, then after settling into our apartment, a delicious lunch at Somers General Store. In the afternoon we went for a walk along the beach, relaxed on the sand - I even went for a swim - and we flew kites. A beautiful sunny day without being hot, the last day of summer in fact, we had the beach virtually to ourselves. But, everyone who did pass stopped to watch and comment on the kites. They were a tad mesmerising; the sound of the wind, the colours, their dance. Crispy skinned pork with a apple puree and spicy chilli risotto, and finishing with a honey cheesecake brulee. Yum. 26. Have a weekend at the beach and 1. Fly a kite. 8 tasks complete, 22 to go. I'd been wanting to scrap this sentiment for a while and one of the sketch templates from Simple Scrapper's March Premium Membership collection seemed perfect for the story. Layout reads: She snuggled in his arms and I saw his heart melt. Our first time babysitting; Claire freshly bathed and cosy in her pajamas and sleeping bag, snuggling into Mike's arms for her bedtime bottle. So trusting, so safe, oh so very loved. 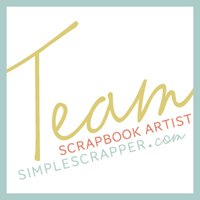 I'd just received a new parcel of scrapbooking products before beginning this layout and it was lovely to use some immediately. Supplies include letter stickers, thickers, diecuts and patterned paper. The Story Starter theme for March at Simple Scrapper is Back in my Day and one of the prompts in particular resonated with me. I first had the idea for this minibook back in 2011, when I asked my Mum to write down some recollections for me. Finally, thanks to the story prompt and a Premium Membership template, the minibook has begun. This layout is about 7 inches by 7.25 inches in size, to fit a pair of craft wood minibook covers I serendipitously picked up on sale the week before. As I didn't have a photo on hand of Mum from a similar time period, I downloaded a photo from the internet to use instead. Supplies include letter stickers. Journaling reads: I was in high school when man first landed on the moon. It was considered such a significant event that any girl living in town who owned a television was allowed to leave school that day and go home to witness this historical event via the new exciting medium of television. I suspect those who remained at school that day, including the bus girls, gathered around some set at school. I sat for hours in our lounge room, absorbing the slow progress being made. My mother was home but I recall a sense of frustration that she was more consumed with household tasks than sharing such a moment in history with me. I assume my younger sister was at primary school that day. I have no memory of her being in the lounge room too. Recounted on January 27, 2011. And if you're noticing little dots on the layout, it's possible I may have photographed this layout immediately after eating breakfast one morning. (Love my vegemite toast.) But why is it I only notice this after photographing, uploading and editing the photos? Oih.